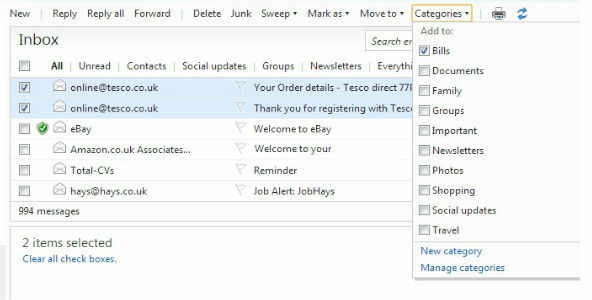 How to organise your email with Windows Live Hotmail? Addbucket » Tech » How to organise your email with Windows Live Hotmail? These days most of businesses are dealing with email, ebill and electronic documents. This is really good environmentally friendly, quick and secures system. Therefore our inbox fills up with hundreds of email in a few months. It is very difficult to search a particular email from thousands of email unless you have applied relevant category on each email. It is very easy and it can organise with just few click of your mouse. Windows live hotmail offer the standard categories in a list but if you want to add some more then follow the stapes on new category. Now you can filter and view your emails according to categories, for example if you are looking for emails for phone bill then all bills related email will be found under bills category. If you want, you can give more than one categories to each email.